(Author’s note)… I have decided that soon, I will post some pictures of some of the aliens from my books, and a little about them. 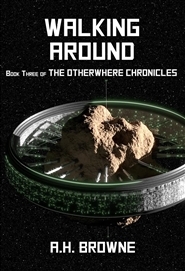 Maybe that will make a few more of you decide to try reading some of this, the fourth novel in my self-published, action/humor science fiction series: The Otherwhere Chronicles. I will throw in some of the back story that explains how this group of humans and aliens ended up trying to stop an invasion from another dimension. I got nothing, Arthur admitted to himself. Yes, he was dead tired and still slightly damp. And yes, he had been very busy. All along the way he had assumed that some sort of plan would pop into his head. So far, they always had. Looking back over his rather strange successes of the past weeks he was honest enough to see just how much of it had been pure, dumb luck. He had just kept going and somehow things had always worked out, but even to him that didn’t seem like the best way to handle a major fleet battle against overwhelming odds. He suddenly understood that he had been falling for his own hype. The universe thought him a hero, so he must be one, but he couldn’t just blunder through this as he had been doing, could he? There was too much at stake. He looked around at the expectant faces, so trusting and so relieved to find out he was still alive, and for a brief moment he despaired. He felt himself utterly unworthy of the universe’s faith in him. He couldn’t just tell these soldiers, his soldiers, ‘hey, follow me, because hopefully I am going to think of a brilliant idea any minute now’. And in that moment of despair something strange happened. He thought about all those billions of people of so many varieties who were, at that very moment, still mourning his death, and the despair vanished under an avalanche of anger at those who threatened the peace and the lives of all those beings. And following the anger was an even larger tidal wave of pride, not in himself, but in his amazing friends who had stuck by him every step of the way with unsurpassed bravery and loyalty. He realized that he was not alone at all. And maybe, just maybe, he considered, that is what heroes really are, just normal people who keep going, no matter how bad things seemed. He turned to Captain Browne and asked her to put the General and the Warlord up on the screen in the ward room. Then he addressed his Captains. “Ladies and gentlemen, allow me to introduce my Vice Admirals, the General and the Warlord, two of the most astute military leaders of all time. And Gup, where are you, buddy?” A little blue head appeared behind the two Xxos on the screen and a little blue hand waved. “There we have perhaps the best tech guy in the universe,” Arthur declared. The Morlan Captain gave a cheer. “At your command, Admiral,” said the Xxos together. But even as they began to stroke the scout craft’s consoles, their images began to strobe with a red warning light and an alarm began to sound. The General and the Warlord immediately understood his plan. “Give us five minutes,” said the General tersely. Arthur turned back to his Captains. “Sorry this meeting is going to be so short. I just wanted to thank you all personally. Return to your ships and await my orders.” And with that he pulled the remote from his pocket and began to disappear. The Captains looked amazed, but they all began to disperse even before Arthur was all the way gone. And they all looked grimly determined, Arthur decided. He watched the bridge of the other Arthur’s ship begin to flicker into his sight. In two minutes he had explained to his near twin what he and his people were expected to do, and then beamed himself back aboard the spy ship. The General and the Warlord showed him their ideas, which they had programmed into the ship’s monitor. He thought it was absolutely diabolical. “Send it to all ships,” he ordered. “Tell them to initiate the plan now. And tell them we are going ahead to the gate to scout around.” The spy ship leaped ahead while the rest of the fleet followed towards the gate at a much slower pace. As the Captains followed, they and their crews studied the plans that had been sent to them. There were many smiles of appreciation. They began to put the plan into action. On the comm screen of the spy ship Arthur watched as messages, first one, then hundreds, began to stream out to the arriving ships of the second wave. These communications were sent in the clear with none of Gup’s trickery, and should be easy for the enemy ships to monitor. And Arthur had to admit his newly recruited first wave Captains were a fine bunch of amateur actors. Arthur watched the tactical screen in grim amusement. On it he could see the big blob of first wave human ships, represented as red blips, being surrounded by the smaller number of green blips that showed Arthur’s allied fleet. The green blips circled the red blips like a school of sharks feeding on a school of helpless mackerel. Now the red blips were being herded back towards the gate, but that wasn’t all. Many of the red blips began to stop or drift randomly off into space. As their Captain’s cut off their identity transponders and cut power to their main systems to simulate battle damage, the blips began to fade from the screen. Some Captains fired weapons, carefully aimed not to hit anyone. Others darted away towards the gate as if fleeing for their very lives. Arthur felt a chill at how real it all seemed. He hoped their audience was appreciating it as much as he was. The face of sub-commander Judy Shafter flashed on the comm screen. And she was really doing it up, Arthur observed with an evil grin. Her face was smudged black and there was drifting smoke behind her. “This is sub-commander Shafter. We are on fire. Half my crew is dead, and we have lost power. We need assistance right n…” Her image flickered with static and disappeared. As the Warlord flew the spy ship toward the gate, Gup sat beside him monitoring the instruments. “I am picking up comm traffic between the second wave ships. They seem to be falling for it hook, line and anchor,” said the Morlan jubilantly. “Sinker,” said Arthur absentmindedly. He stood behind Gup, watching as more red blips spit out of the gate like tracer bullets from a machinegun. They moved to form into squadrons in a not-overly-brilliant display of spacemanship. What Arthur didn’t yet know was that another type of predator had been drawn to this fake feeding frenzy, the voracious news hounds known as the Reporters. With their incredible noses for a good story they had begun swooping around the edges of the pseudo space battle like seagulls looking for bits of rent flesh from the mackerel being torn apart by the sharks. Come on now, admit it, that was a pretty darn good analogy, and the imagery wasn’t bad either. But what you may not know is that space battles are not easy to broadcast live. While the blips may look close together on a ship’s screen, the action takes place over a huge area of space and at tremendous speeds. The Reporters, five or six of them, did the best they could, and this worked out rather well from a propaganda point of view. They showed the occasional ship zipping by in a flash. And they showed some scenes of dark, powerless hulks tumbling through the void, backlit by bursts of energy bombs and long trails of energy beams. They had no way of knowing these hulks were just shut down and not destroyed, or that the beams and bombs were striking nothing at all. The most powerful part of the broadcast, watched by trillions throughout the universe, were the open channel communications of the supposedly panicked human ships of the first wave. Joey Scarfone, the other sub-commander, turned out to have a real flair for the dramatic. By the simple expedient of crumpling up some paper and lighting it on fire just below and out of sight of the bridge comm camera, he really did look as though he was sending a message from a dying, burning ship. Behind him, smeared liberally with catsup, bridge personnel lay scattered about or hung off their chairs in the contorted positions of violent death. As the final touch, the sub-commander simply turned his dark eyes to the camera and screamed like a lost soul. And the universe decided, ‘we are kicking their asses’. 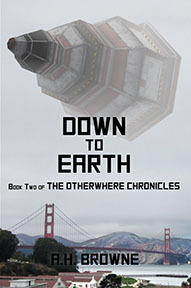 This entry was posted in fiction and tagged aliens, art, books, humor, novel, science fiction, science fiction novel, science fiction series, writing. Bookmark the permalink.